These are our 3 favorite beaches on the Big Island. Read why we like those beaches so much and learn why the sand on those beaches is white, black and green. 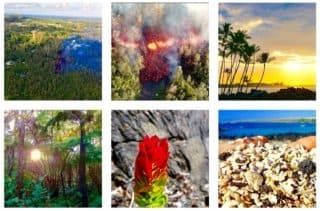 See our complete list of Big Island beaches for the great beaches that didn’t make it into our top 3. We also have some pretty solid advice on beach activities on this website. See for example our information about snorkeling rentals and snorkeling safety in our snorkeling guide or read about our 3 favorite snorkeling beaches. If you are in Hawaii between December and early April you should make sure to read our whale watching guide. 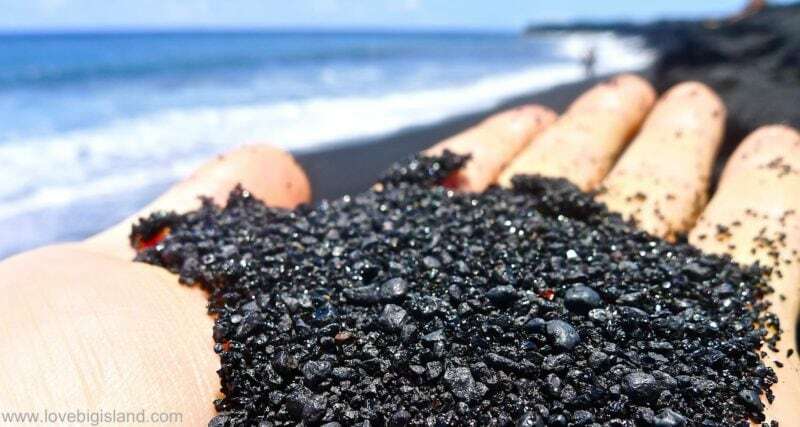 The sand on all black sand beaches on Hawaii is made out of tiny fragments of lava. 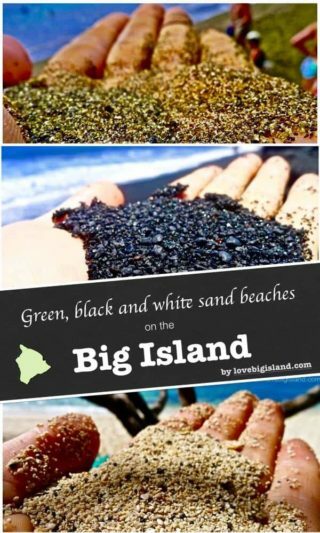 In contrast to the green and white sand, most of the black sand is created almost instantaneously. When hot lava enters the water it cools down so suddenly that it solidifies, and shatters into large amounts of black sand. Black sand is also very good at retaining heat as you will notice when you are walking on the sand during a warm sunny day. This is the reason why the sea turtles choose black sand beaches to build their nests. The best beaches to spot turtles are beaches with black sand. Punalu’u beach is the most famous black sand beach on Hawaii. 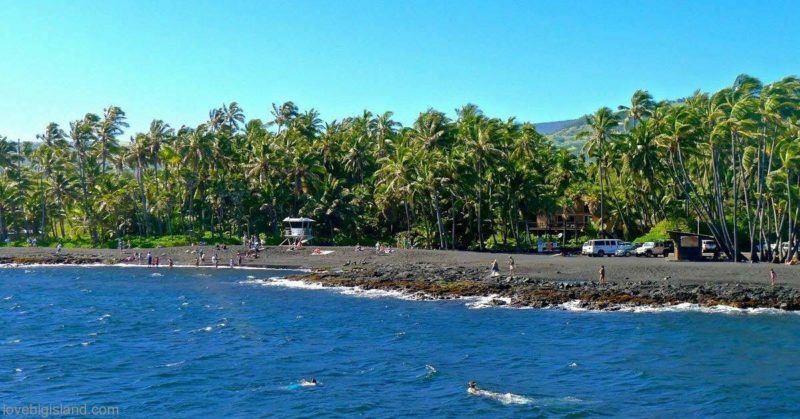 It is even known as ‘Black Sand Beach’. Punalu’u is the most expansive and easily accessible black sand beach on the Big Island, and well-suited for seeing turtles, sunbathing, coastal hikes or a nice picnic. Swimming or snorkeling is also possible, but there may be other places more suitable (See below). You can often also see the endangered Hawksbill and Green turtles basking in the sun on the beach. Swimming: Unfortunately, there can be strong currents in the water at Punalu’u beach. The best place to enter the water is the small boat ramp on the left (facing the water) of the beach. Stay out of the water if the surf is high. Snorkeling: Snorkeling at Punalu’u is often difficult due to low visibility. The best place to snorkel nearby is Ninole Cove. Ninole Cove is a short walk from Punalu’u and offers a sheltered bay with sand channels that provide decent entry into the ocean. You can either drive there (park below the sea mountain golf course clubhouse) or take a short but rewarding hike from the Punalu’u parking lot. Follow the unmarked grassy trail southwards (going right if you face makai/the ocean) for 5 minutes. Punalu’u beach is most easily accessible from Volcano Village and is one of our recommended activities while spending time in Volcano. To get there from Volcano Village, take Hwy 11 towards Kona, and turn Makai (towards to ocean) between mile marker 56 and 57 on Alanui Road. If you pass Whittington Beach Park, you have driven too far. 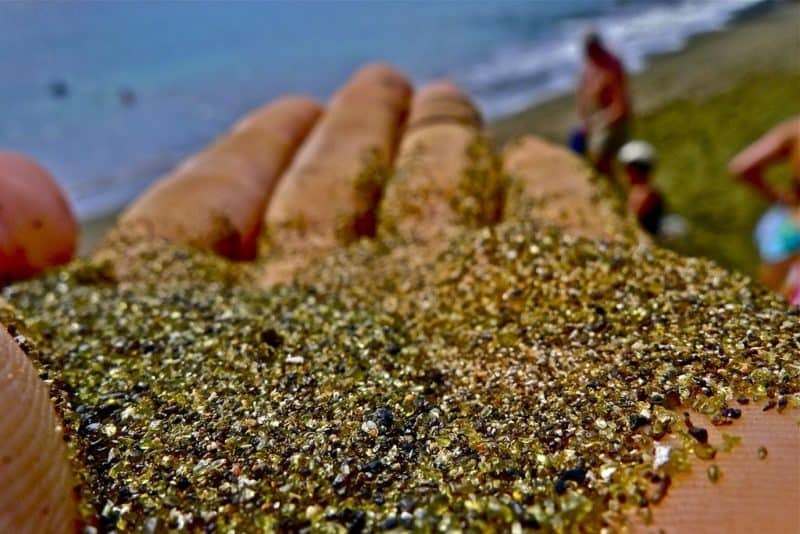 Green sand beach gets its name from the green glassy olivine crystals that make up most of the sand on this beach. The olivines are washed out of a 49.000-year-old cinder cone that spewed olivine-rich lava, and that still is visible on the east side of the bay. Olivine is locally known as “Hawaiian diamond and is denser and tougher than the ash fragments, glass and black pyroxene that make up the rest of the rocks and lava flows. Therefore it tends to accumulate on the beach whereas the usual volcanic sand is swept out to sea. The ‘greenness’ of the beach then is a direct reflection of the ratio between the green olivine and the other sand-components. Green sand beach is one of two green sand beaches in the united states, and not easy to reach. It takes a day trip to really enjoy this beach (take a picnic basket! ), but the payoffs are great! Its remoteness guarantees that you will have most of the beach for yourself, and the bay is calm and good for snorkeling. 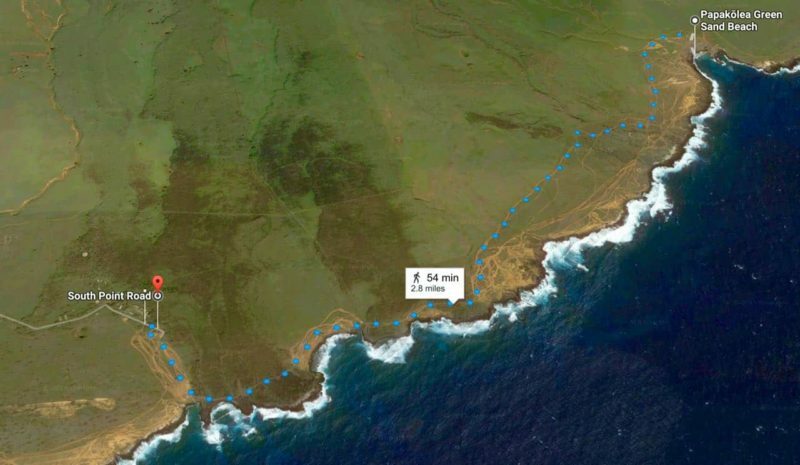 The hike to and from green sand beach is 5-mile round trip (see directions below), so be prepared and take plenty of water. This is one beach that you will not easily forget in the coming decades! Take the road to ‘South Point’ between mile markers 69 and 70 on Hwy 11 (between Kona and Volcano Village), and drive to the small harbor at the end. Here you find a parking lot where you can leave your car. Although it is possible to take a 4WD car all the way to green sand beach using the car damages the road and environment and is heavily frowned upon by the locals. Walk to the ocean and take the road to the left (facing the water, East direction). Follow this road with the ocean on your right hand for about 2 1/2 miles and you will get to the cliffs above the Green Sand Beach. Climb down along the lava cliff on the west side of the bay, and wear plenty of sunscreen! 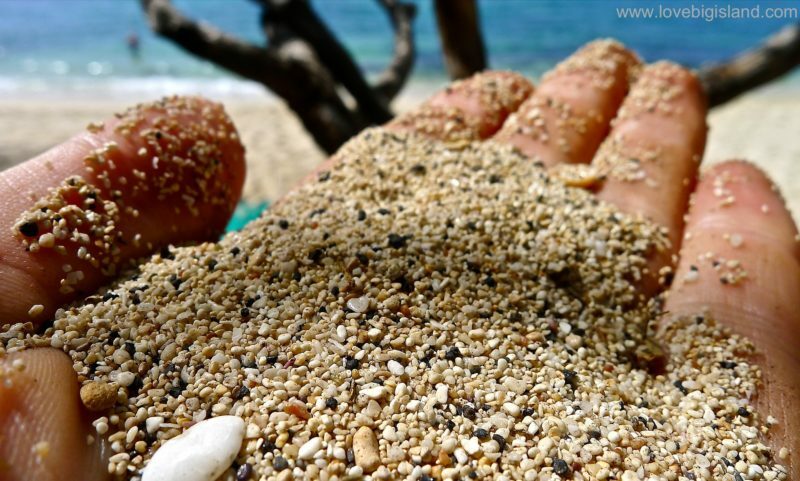 In contrast to most white sand beaches that are composed of ‘inorganic sand’ (e.g. quartz and other minerals), the white sand on the beaches of Hawaii is mostly made of shells from marine organisms and coral fragments. Waves (“mechanical erosion”) and marine animals (“biological erosion”) team up and break down the reefs and shells to deliver the sand to the beach. Parrot fish are especially known for munching the coral whole and spitting it out as sand. One downside of this if that this kind of sand is not suited for building sand castles. The sand tends to have rounded edges and does not stack well. Pick up a couple of grains and have a closer look if you are interested in the exact composition of the sand. Chances are you can still recognize many shells and pieces of multicolored coral. For an extra spectacular effect, try the macro function on your (digital) camera. Hāpuna beach is 1/2 mile long, almost always sunny, and has a continuous shore break that is great fun to play in for all ages. This beach only gets 10 inches of rain annually, and the beach is lined by trees and a shaded picnic pavilion to offer shelter. There is also a professional lifeguard on duty year-round, making this a great family beach. Oh, and we almost forgot to mention that Hāpuna Beach regularly is voted among the ‘best beaches in the world’! Snorkeling is also good at Hāpuna beach. You can snorkel around the small cliff to the north of the beach (but do not go alone, you will not be in sight of the lifeguards there), or around the rocky point on the South of the beach. The downside of these stellar statistics is that the beach can become very crowded. Make sure to go early for a good parking spot and a shady place on the beach. Hāpuna Beach lies North of Kailua-Kona, around mile marker 70 of Hwy 19. Turn makai (towards the ocean) at the sign for Hāpuna Beach State Park and continue for 1/4 mile to the large parking lot. Do not leave valuables in your car! Visitors to the Big Island pay a $5 parking fee to help maintain the park. Parking is free for locals. We realize that the web is changing, and that social sharing is rapidly becoming more important. Because of this we are experimenting with making more ‘shareable’ images and we are exited to find out what you think about them. If you do like the image below, please consider sharing it on your favorite social media. If you want to go overboard you can tag us with the share and show us the love. Mahalo!